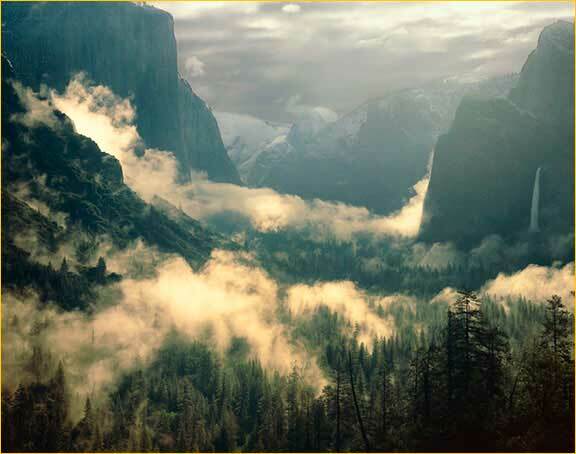 ... to Yosemite, one of the planet's most beautiful places. During your visit to the Queen of the National Parks, lodging in my chalet, on the side of a mountain in the middle of a Sierran forest, will enrich your experience beyond description. You have my pledge that everything will be done to make your stay at Starlit Chalet comfortable, safe and a joy to remember all your days. For everyone ... not just the lucky folks who reserved Starlit Chalet for their Yosemite adventure. If I can help you have a great experience in Yosemite, I've fulfilled a big part of the reason I opened a vacation rental ... to help everyone get closer to nature. You and I know that when we value nature, we take better care of our planet home. Please use the information below to have wonderful days in this magical place. I’ve been hiking the Yosemite area for 20 years. I know the places you need to see. If I were to be here a week or less, here’s where I would go. Follow this list faithfully and you will have a great visit. Sleep when you return home! There are map resources in the chalet with more detail. Also, you will get a map when you enter the Park. Use the internet. I didn’t indicate where the restrooms were located. They're everywhere. And if you can’t make it to everywhere, hikers will tell you there are many, many trees in the Park. This schedule includes easy to moderate hikes. For experienced hikers, there are many great longer hikes: Cloud’s Rest, Nevada Falls, the Waterwheel and the Panorama Trail (start with 4-Mile Trail) are 4 of my favorites. If you only have 2 full days, do the first 2 days. If only 3 days, do the first 3, and so forth. Use the Day Hikes links below for more great info. Arch Rock. Enter Park through Arch Rock on 140, a comfortable 1 hour drive from the chalet along the Wild and Scenic Merced River. Bridalveil Falls. 15 minutes or so past the Arch Rock, make a right where South Drive and 41 meet. Immediately turn left to enter Bridalveil Falls parking lot. Take the short hike to the Falls. Return to your car, then go left as you leave the lot. Tunnel View. In a few minutes (before entering tunnel) turn right into parking lot. After filling your camera's memory card, enter tunnel, continue to Chinquapin. Turn left on Glacier Point Road. Glacier Point. Magnificent! Plan to spend a couple of hours here. Did you pack a lunch? This would be a good place to enjoy it. There is a snack bar. If you want a great photo, take the Illilouette Falls/Panorama Trail (off to the right as you face Half Dome), go down trail about 15 minutes and stop. That’s where I made the Half Dome photo hanging in the Great Room in the chalet. 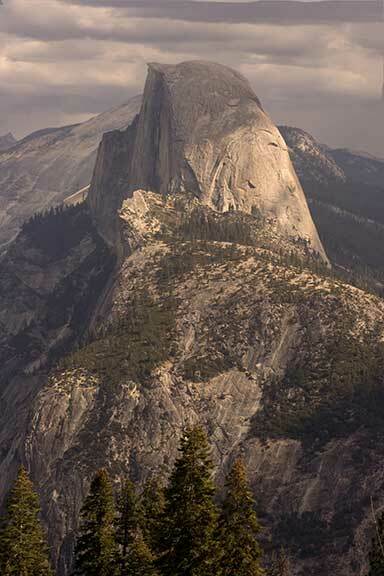 10 minutes before arriving at Glacier Point, you will see the Sentinel Dome-Taft Point trailhead and parking lot. When you return from Glacier Point, park here. Do one or both hikes. Taft Point is about a mile from the lot on a relatively flat trail. Well worth doing. Sentinel Dome, also about a mile, looks intimidating as you approach from the back, but when you see so many people doing it as you come around to the other side, you may be tempted. 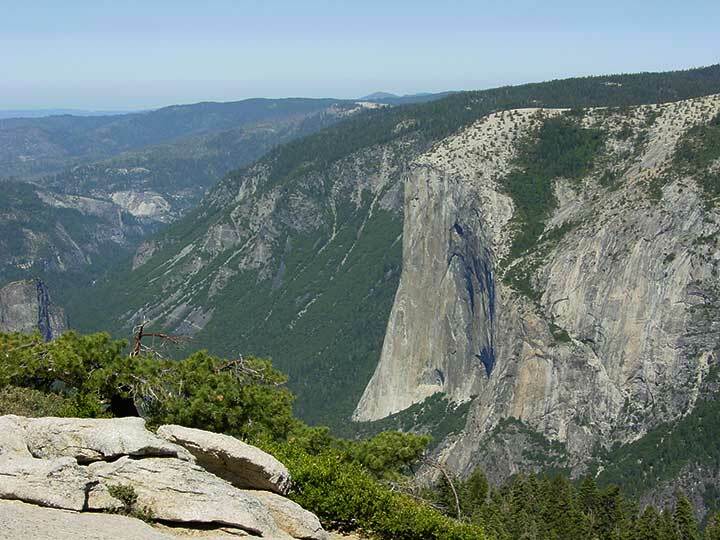 It’s one of the easier hikes in the Park and you will be rewarded with a 360° view of Yosemite. Yosemite Bug Hostel. You're tired and hungry and don't want to cook. On the way home, along the Merced River, as you leave the river, you will go up a steep grade. At the top of the grade there is a YARTS bus stop and a Yosemite Bug sign. Turn right and follow the road into the old church camp converted to a modern hostel, spa and restaurant. Interesting menu, good food and lots of hikers and Yosemite lovers, many from around the world. Repeat the drive through Arch Rock, do not turn right at Bridalveil Falls, and soon you will see El Capitan on your left. Stop for photos because you may not be coming past this point again. El Cap is 3,200 feet / 1,000 meters or as tall as 3 Empire State Buildings. Next, you will see Yosemite Falls on your left. You pass Yosemite Chapel on your right. Lots of weddings there year-round. At the first stop sign, turn left and immediately park. Walk back to bridge to get shot of Half Dome with the Merced River in front of it. Get shots of Yosemite Falls at the parking lot. Continue driving and follow signs to the Ahwahnee Hotel. Walk to Yosemite Falls after breakfast. Leave your car at the hotel. Two miles each way, very flat and very beautiful. Not uncommon to see a bear or deer. Do not approach any wild animal. Drive to Yosemite Village and walk to Yosemite Visitors Center. Lots to see in this area and several places to eat, buy souvenirs, see a movie about Yosemite, visit an Indian village. Vernal Falls Footbridge Hike. After lunch or a snack, drive to Curry Village, park, then catch the free shuttle to Happy Isles. Hike across the river, turn right and head for Vernal Falls. The trail is paved but it is still a good work-out. People of every age and physical condition do this hike. Lots of huffing and puffing but most make it. About halfway you will see Illilouette Falls on the right. 1.6 miles/2.6 km round-trip. Camp Curry is worth a stop before heading back to Mariposa, but not for dining. There is a good restaurant, a cafeteria and a lounge, at Yosemite Lodge. Mariposa Grove. Giant (HUGE!) 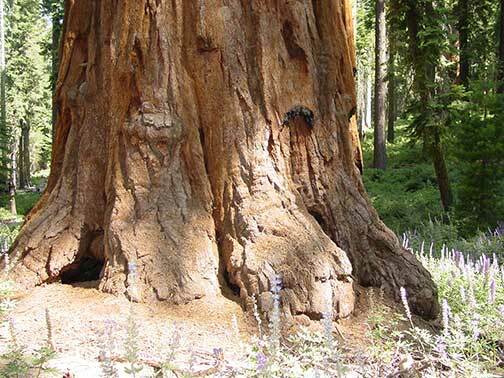 Sequoia trees. Drive through Oakhurst, entering Park through Highway 41 kiosk. (Tip: in summer, to be able to drive directly to the Grove, arrive at the kiosk by 8:30. The Grove parking lot fills up early, the road closes, and you will be directed to the Park shuttle, adding an hour or two to the trip.) Short and long hike trails begin in the Grove. An open-air flatbed tour "truck" can be boarded here for a guided tour. Wawona Hotel. A 20-minute drive from the Grove. Lunch at this lovely old hotel or buy an ice cream cone just past the gas station, then walk over the covered bridge to the Pioneer History Center. On Saturday during the summer, the hotel has a barbecue on the front lawn. And there’s a 9-hole golf course. Ready for a hike? Swinging Bridge Loop. This 2-hour, level, 4.8 mile / 7.6 km hike begins at the Wawona Store parking area. 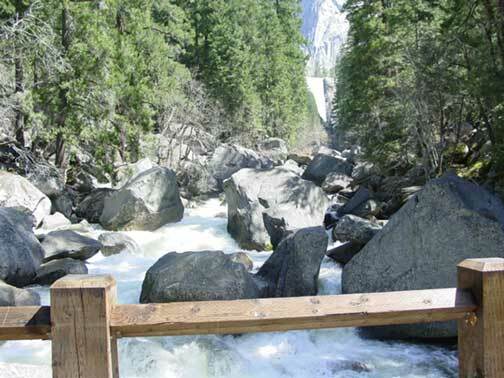 See Day Hikes in Wawona. The return to the chalet through Oakhurst is quickest. This might be a good time to stop at Raley’s supermarket or Starbuck’s or the Cool Bean Cafe for a cup of Fair Trade coffee (next to McDonald’s). You may need a break from nature and driving. A day spent in Gold Country could be just the ticket. Mariposa has 2 museums, interesting shops, and plenty of places to eat. The High Country Café is my favorite lunch spot. And for local mountain characters, it’s hard to beat the Happy Burger. Or, if you find yourself in Mariposa in the early evening, Savoury’s is an excellent choice for dinner. Mariposa rolls up its sidewalks around 8 pm or so, so don’t plan on a late dinner. Mariposa has a Visitor's Center and there's a playground at the county park (above the Best Western Motel). If Mariposa’s city ways are still too intense, you could skip all this and go to Briceburg, walk along the Merced in either direction or sun yourself at one of the small beaches – head north along the river to find 2 campgrounds with their beaches, restrooms and picnic tables. There are numerous spots along the river that invite the more adventurous beach-seekers. The current is strong in early summer, so be careful. 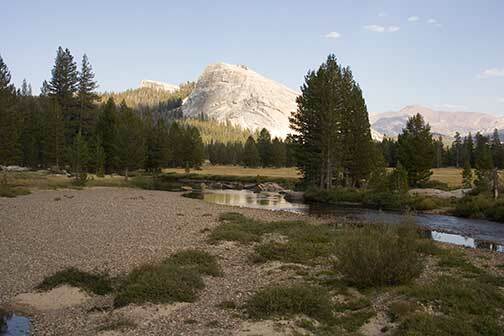 Tuolumne Meadow . Yosemite is huge and it takes time to get to places, but Tuolumne Meadow, 2.5 hours from the chalet, is worth every minute of the unforgettable drive through high country. Trees, granite, wildlife - like being on another planet! Enter Yosemite through the Arch Rock, turn left at 120, go up the grade and turn right at Crane Flat gas station on to Tioga Pass Road. In about an hour, you come to Olmstead Point, a great view of the high country. Shortly after the Point, you come to Tenaya Lake. Walk the edge of this high country lake. Study the Day Hikes link and make your choices on hikes. And stop at the Tuolumne Visitor’s Center for other ideas. Just being in the Meadow at 7,200 feet / 2,200 meters is a delight. The campground serves breakfast and dinner in a great atmosphere. On your return, after passing the Oak Flat gas station and heading down the grade, watch for a vista point on the right. Fantastic view of Half Dome and the Valley. 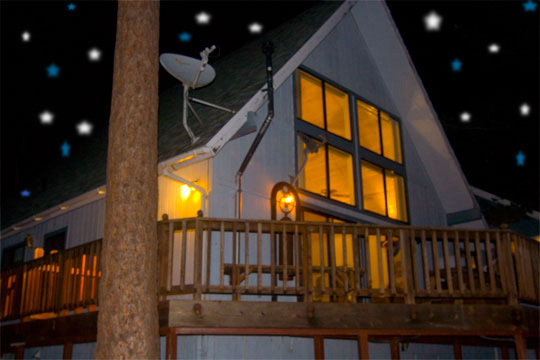 Day Hikes in White Wolf You might plan an early breakfast at the White Wolf Lodge. The dining room is charming and is filled with like spirits, all preparing for a day in the high country. There are a number of day hikes out of White Wolf to keep you interested. Mono Lake. Alternatively, if you like to drive, continue on the Tioga Pass Road past Tuolumne Meadows, leave the Park, and head down the eastern side of the Sierra to visit Mono Lake. If you do this, the Mobil Gas Station at the bottom of the hill is a very popular place to eat – the Whoa, Nellie! Deli. The Mono Lake Visitor’s Center just north of Lee Vining should be your first stop. Then, visit the Lake with your camera. 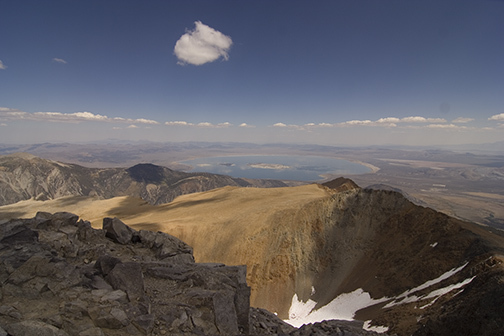 The Mono Lake environmental community took on Los Angeles years ago to stop it from draining the lake; a great story. P.S. If you're struggling with a decision to go to Yosemite or to a famous theme park, click here and read Which Option Should I Choose?